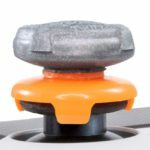 KontrolFreek is the most popular brand when it comes to thumb sticks and their collaborations with developers has provided players with a good range of products featuring iconic designs from their favorite video game. 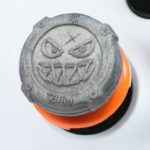 One of the most popular franchises is Call of Duty, and KontrolFreek has launched a new design; the Call of Duty Black Ops 4 Grav Slam. Let’s take a look at how the second design differs from the first one. As is common with KontrolFreek’s Call of Duty thumb sticks, the Call of Duty Black Ops 4 Grav Slam stick extenders have been designed in collaboration with Treyarch Studios. Whilst the Call of Duty Black Ops 4 stick extenders had a dull design, the numeral III logo in the signature orange and black colors, the Grav Slam sticks continues the range of iconic designs. This time the design is inspired by Ruin’s in-game specialist weapon, the Grav Slam. The design itself reminds us of the fierce nose paint found on planes or torpedo boats during the world war with the large, sharp teeth and angry eyes. Personally, I think it’s one of the best designs they’ve ever done and one hell of a ferocious one, perfect for those that want to create a bolder look for their gear. As for the colors, the signature orange is back again but this time it’s accompanied by a silvery grey. A great color combination that would fit with any controller color. 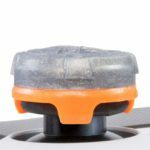 As you can see from the package, these stick extenders come with a free bonus; an exclusive unlock code can be found in the insert so be sure to check the package thoroughly before throwing it in the bin. The in-game bonus item is a Target Practise calling card, a great cosmetic item for those who play the game but less for those who would buy these stick extenders for the looks. The pack comes with one mid-rise and one high-rise stick, very similar to the FPS Freek Galaxy sticks. As for the height increase, the mid-rise raises 7.05mm whilst the high-rise raises 11.86mm, making the high-rise stick slightly higher than the Call of Duty Black Ops 4 sticks. This difference is mostly due to the convex design, which is a first in the Call of Duty thumb sticks since most have a concave or hybrid design. For players with smaller hands, the convex design can be challenging as the thumbs will need to rest on top of the stick instead of having the thumb “lay” inside the surface, and slippage can happen. The design does have an outer edge which allows a good grip even if you would slip towards the edges. As for the rest of the design, it’s etched deep enough to provide a pretty good friction. If you come from a mid-rise and high-rise setup, it doesn’t take much time to get used to it safe for the convex design. Installing these thumb grips was easy, simply push them on the analog stick of your controller. These extenders will give a nice loud click, so you’ll know they’re properly in place. The high-rise stick was quite tight, so it doesn’t twirl around whilst the mid-rise can twirl around but not in an obtrusive manner. If it does happen to rotate while you’re gaming, it’s barely noticeable and the friction doesn’t falter. 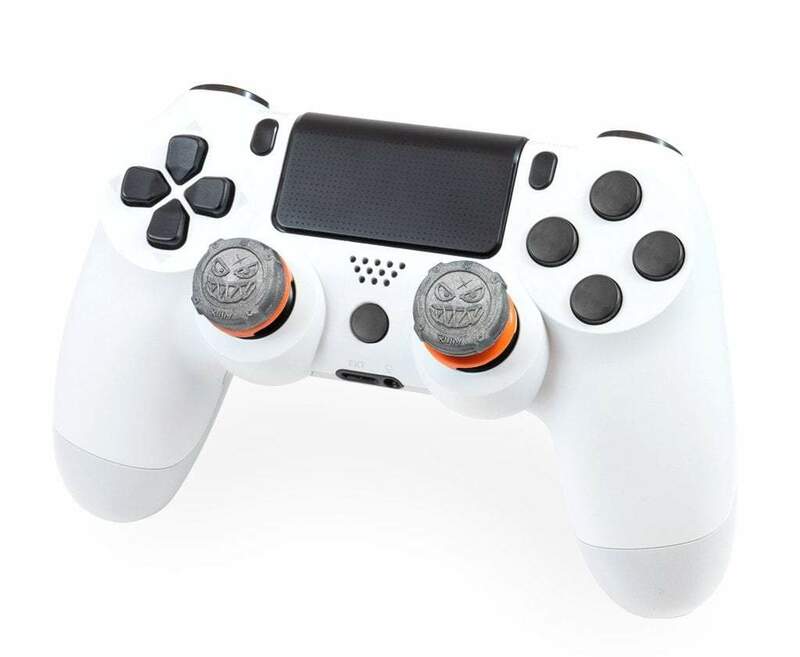 The Call of Duty Black Ops 4 Grav Slam thumb sticks are designed to work best in first-person shooters, most importantly in Call of Duty: Black Ops 4 but also in its counterpart BattleField V. Other titles that are advertised with the sticks are Red Dead Redemption 2 and Fallout but obviously these grips work well in any type of game, so you shouldn’t be worried if you’d rather play Diablo 3 or Crash Bandicoot with these. 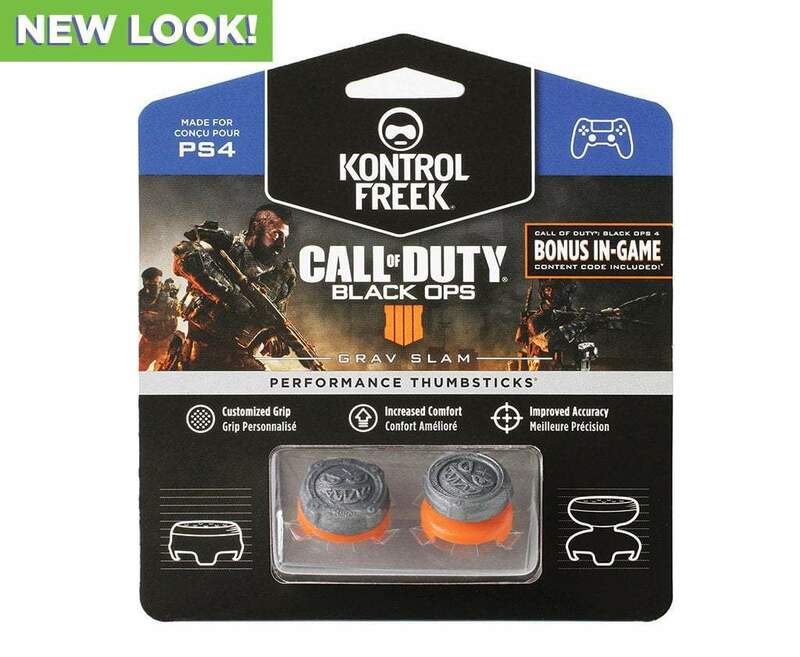 The first Call of Duty: Black Ops 4 sticks were a real downer but KontrolFreek upped their game once more with the second Black Ops 4 thumb sticks. The design is spectacular, fierce and bold with a great color combination of silvery grey and the signature fiery orange. Despite it being a convex design, the sticks are comfortable and have a good grip. All-in-all, these thumb sticks have it all; great fierce design, good color combination, good friction, good height. We can definitely recommend these.